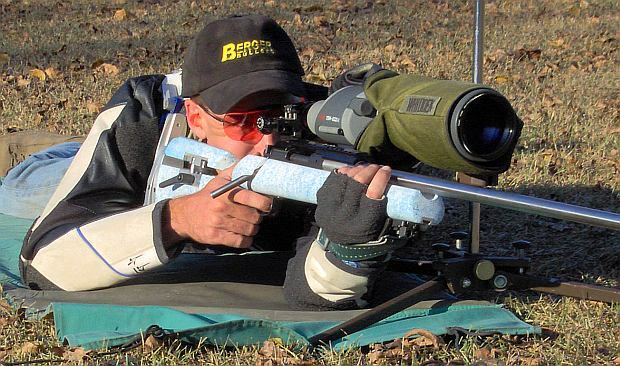 John Whidden of Whidden Gunworks used a collection of .243 Winchester and .308 Win rifles to win his third NRA National Long-Range Championship this week at Camp Perry. 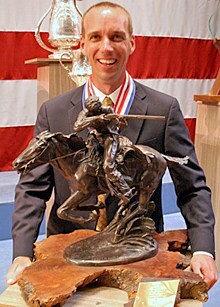 We had a chance to discuss Whidden’s winning guns during a long telephone conversation with John yesterday, as he motored back to Nashville, Georgia. John revealed some interesting facts about his long-range arsenal. For the “Any sights, Any Rifle” and “Iron Sights, Any Rifle” stages of the Long-Range Championship, John used three different .243 Win rifles. He shoots the same load in all his .243s: Berger 105gr VLD bullets (moly-coated) with N160 powder and PMC (Russian) primers. The bullets are seated very long, with about .001″ neck tension, so the bullets “soft-seat” themselves into the rifling as he closes the bolt. This way he can use the same ammo in different guns and the bullets always find the same seating depth relative to the rifling. John uses a very stout load of N160 that drives his Berger 105s at about 3,300 fps. No that is not a misprint. John launches thin-jacket 105s at 3,300 fps and he doesn’t have an issue with bullet blow-ups. Moly helps keep the heat down, but John’s Broughton 5C (canted land) barrels are key. These are gentler on the jackets than barrels which have very tall or sharp lands. At 3,300 fps, the 105s deliver ballistics that are hard to beat, according to John: “My .243 shoots inside a 6.5-284 with 142s. Nothing out there is really ahead of [the .243], in 1000-yard ballistics unless you get into the short magnums or .284s and those carry a very significant recoil penalty. In the past I did shoot the 6.5-284. I went to the .243 because it had similar ballistics but had much less recoil. It doesn’t beat me up as much and is not as fatiguing. For the “Iron Sights, Any Rifle” stages Whidden uses a .243 Win with a Gilkes-Ross action, Warner Rear Sight, and CG front sight with +0.5 diopter. As with John’s scoped .243s, this gun has an 8-twist, light Palma contour, Broughton 5C barrel. This is the same gun and 32″ barrel John used to set the Leech Cup record in 2008. It has about 650 rounds through the barrel. The chambering, as with his other “Any Rifle” guns, is a “plain vanilla .243 Win”. Whidden’s .308 Winchester Palma Rifle is the same rifle we featured as our Gun of the Week Number 59 (photo below). It’s the same gun with the same barrel, a 32″ Broughton 10-twist with 5C rifling, light Palma contour. Round-count on this barrel is over 3000! John’s current .308 Win load is a very stout charge of N140 power, PMC primers, and 185gr Berger moly-coated VLDs. The brass is Lapua .308 Win with the standard large primer pocket/large flash holes. He turns his case-necks for a .333″ loaded round in a .343″-necked chamber, which was cut with the popular “95 Palma” reamer. As with his .243s, John loads his .308 ammo long and “soft-seats” his bullets with bolt closure. Share the post "Whidden Shares Secrets of Championship Long-Range Rifles"
According to the Korea Times, the U.S. Government (branch and officials unknown) has stymied plans by the Korean Defense Ministry to sell 86,000 M1 Garands and 22,000 M1 Carbines to American gun collectors. The gun export program was designed to augment Korea’s defense budget, and the Defense Ministry had hoped to start shipping rifles at the end of 2009. But somebody in Washington has blocked the re-importation of the classic Garands and Carbines. The problems the U.S. government cited were somewhat ambiguous, said an official at the Ministry of National Defense on condition of anonymity. “The U.S. insisted that imports of the aging rifles could cause problems such as firearm accidents. It was also worried the weapons could be smuggled to terrorists, gangs or other people with bad intentions,” the official told The Korea Times. “We’re still looking into the reason why the U.S. administration is objecting to the sale of the rifles and seeking ways to resolve the problems raised,” he said. Gangs Armed with Surplus Garands? 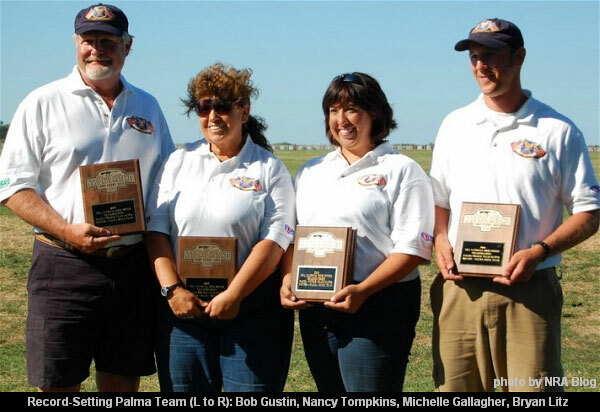 Share the post "Feds Block Import of M1 Garands and M1 Carbines from Korea"
Team member Bob Gustin also won the Individual Palma match with a 450-33X, not dropping a point. That’s remarkable considering Bob shoots right-handed while sighting with his left eye through off-set rear and front sights. Congrats to Bob and all the team members. Bryan Litz won’t take any time off after his team’s record-breaking performance. Bryan reports: “I’m on my way to Canada now for the America Match this Sunday — a bi-annual international fullbore match.” Good luck Bryan. Share the post "New Record Set at Camp Perry Palma Team Match"